VANCOUVER, British Columbia (CNS) — With the threat of snow in the air, groups of young men filled the pews at Our Lady of Sorrows Church on the city’s east side. The men were seasonal farmworkers from Latin America attending a special Christmas celebration in their honor. 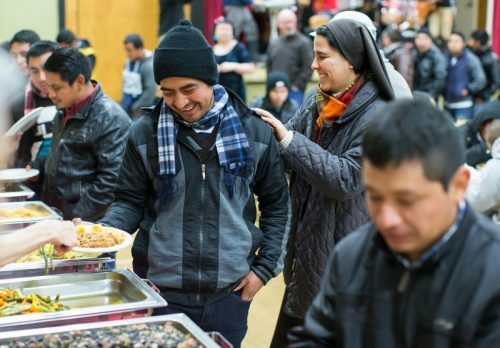 After Mass celebrated by Vancouver Archbishop Michael Miller, the approximately 350 farmworkers joined the archbishop for dinner in the parish hall. The meal was prepared and served by volunteers from different groups in the parish, including Scalabrinian Lay Movement members and volunteers with the archdiocese’s Hispanic Ministry. Our Lady of Sorrows Parish had been hosting the archdiocesan Christmas celebration for the farmworkers since 2010. Alfredo, who only wanted to be identified by his first name, had been in Canada for eight days when the dinner was served Dec. 17. The 38-year-old father of three children, ages of 6-15, said he worked in agriculture in his hometown of Puerto Barrios, Guatemala. However, the pay was not enough to support his family. Alfredo said he signed a 14-month contract working in Canada “for a better future,” adding that he wanted to give his children a chance to have an education. He said he worked eight hours a day at a cucumber farm in Langley, where he lived with 13 other men in a house on the same farm. Cesar Batz had already worked three 10-month contracts in Canada. Although it was difficult to leave his wife and four children in Guatemala, the Hispanic Ministry’s outreach to farmworkers helped him feel “like I’m with family,” he said. Batz was introduced to the volunteers at Sacred Heart Parish in Delta through another farmworker during his first contract. “I found friendship and happiness, a place where I felt good. It helps my wife and children as well to know that I am participating in something positive,” Batz said. Manolo Mairen also had worked three 10-month contracts in Canada. “When I was getting ready to come to Canada I wondered, ‘Where am I going to end up?’ I was always active in my church and I wanted to find good friends,” he said. After his first day of work in Canada, he joined men going to church and was pleased to discover it was a Catholic church. He said being away from family and friends for such a long time could easily lead some men into temptation and bad situations, but being part of the activities offered by the Hispanic Ministry’s outreach to farmworkers gave him good friends and helped him continue to live his faith as he did in Guatemala. Many of the volunteers involved in outreach to the farmworkers have experienced firsthand what it feels like to be a stranger in a new country. Rosario Musso, a volunteer from Sacred Heart Parish, came to Canada from Peru. Her fellow parishioner Alicia, who only wanted to be identified by her first name, also immigrated to Canada from Mexico. Mary had her own annunciation, after which she went to visit her cousin Elizabeth, he said; upon her return to Nazareth the first signs of her own pregnancy would have been evident. “Just imagine what the gossips at the market would have been saying. Joseph suffered,” Archbishop Miller told the congregation. “Being faithful men, we sometimes have to take upon our shoulders the problems of other people. 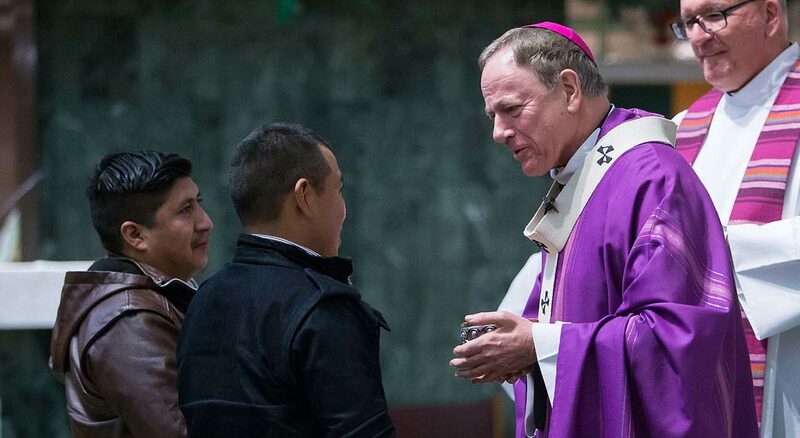 Like a father has to take on others’ problems,” Archbishop Miller said. Yet Joseph left room for God and was able to hear his voice, as a result “Joseph found true happiness,” he added. Archbishop Miller said the “annunciation” to Joseph, his decision to spare Mary public shame, and the way God opened a new and unexpected path for him were a reminder that God manifests himself in people’s real lives, not in a perfect world.